TOKYO and SUNNYVALE, CA--(Marketwire - November 19, 2008) - Fujitsu Limited today announced Interstage(R) XWand(R) Version 10, the latest release of its acclaimed XBRL (1) software designed to help companies increase transparency and governance around financial activities. The newest release is one of the industry's first offerings to incorporate the power of business rules in XBRL-based reporting with the adoption of XBRL Formula 1.0 (2), the latest extension to the XBRL specification. Early test results in customer environments have shown significant reductions in the time and cost associated with verifying and submitting financial reports. The U.S. Securities and Exchange Commission (SEC) has proposed a new mandate which would require companies using U.S.-based generally accepted accounting principles (GAAP) with a market capitalization of more than $5 billion to use XBRL for financial disclosure beginning in 2009. All public companies would follow suit by 2011. This is one of several global initiatives aimed at financial reform. As a founding member of XBRL Japan and former chair of the XBRL International's Specification WG, Fujitsu continues to drive the development and adoption of the specification across the realm of financial reporting. 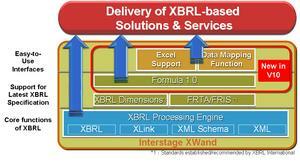 Interstage XWand Version 10 incorporates the latest efforts of XBRL International. 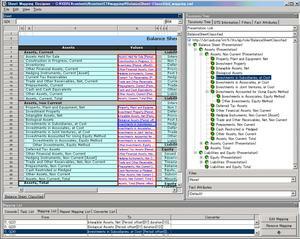 Fujitsu launched the Interstage XWand software in 2003. The product has since been adopted by customers in 23 countries, helping to make XBRL an international standard for financial reporting. "XBRL is the future for transparency in financial activities, and Fujitsu continues to lead the industry in helping companies prepare for this new reality. In an era when financial activities will be more heavily scrutinized than before, Fujitsu is making it easier, simpler, and more cost-effective to not only adopt XBRL for compliance, but to also go beyond compliance and gain far greater efficiency in financial processes." Fujitsu, the Fujitsu logo, Interstage, XWand and TRIOLE are trademarks or registered trademarks of Fujitsu Limited in the United States and other countries. Microsoft and Excel are trademarks or registered trademarks of Microsoft Corporation in the United States and/or other countries. All other trademarks and product names are the property of their respective owners.